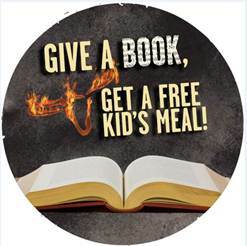 ·All families have to do is donate one children’s book (new or used) suitable for ages 5-12 at their local LongHorn restaurant on April 2. ·As a special “thanks,” participating guests will receive one free kid’s meal from LongHorn’s kid’s menu with the purchase of one adult entrée. All books will then be donated to local Boys and Girls Clubs to refresh Club libraries. I think more resturants should do this.